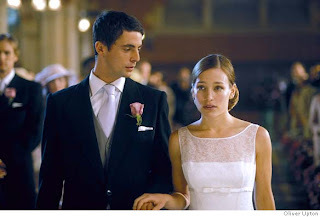 Before the minister asked attendees if there were any objections to the marriage of Rachel (Piper Perabo) and Heck (Matthew Goode), perhaps it would’ve been better if he’d checked with the bride. In writer/director Ol Parker’s debut film, pretty and thoughtful Rachel is all set to marry her best friend Heck but finds herself pulled by unexpected stirrings on the way to the altar after she catches sight of Luce (Lena Headey), the beautiful florist her mother had hired to piece together the bouquets and arrangements for Rachel’s big day. At the reception, the two become fast friends when Luce rescues Rachel’s oversized wedding ring from the party punch bowl and although Rachel tells husband Heck that she feels a certain near soul-mate like friendship connection with Luce, she and Heck decide to play matchmaker by inviting Luce and Heck’s obnoxious humorous admittedly cad like friend (as is always the case in British comedies) to dinner but before he arrives, Luce admits that she’s just not that into men. Her confession complicates Rachel’s ability to spend time with her new friend, not out of prejudice but the opposite as she begins to see that her lifestyle may be the one Rachel had belonged in all along, although Luce tries to distance herself from her acquaintance not wanting to mess with a couple’s happiness. Despite the overly polite and as several critics pointed out, unbelievably convenient and nearly apologetically chaste proceedings that made Imagine Me and You the second recent film including the bright but admittedly far fetched Gray Matters to deal with a marital love triangle and female’s coming out, the charms of not only Headey and Goode but especially the always under-utilized Piper Perabo make it entertaining. Although as a straight filmgoer, I can see the arguments of my gay friends in their opposition to the trite plot points and feel this may have begun in the film’s initial stages as it was originally written as a heterosexual love story (IMDb), it’s still another forgettable, escapist British comedy that’s sure to delight.